More than 8000 kilometres are between us, but it seems to me that Robert Gallo is just sitting in front of me, answering my questions. Gallo is Gallo, he is always authentic and he has charisma. 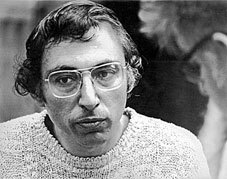 The US-scientist, born 1937 in Waterbury (Connecticut), is well known as the discoverer of the first human Retrovirus (HTLV) at the beginning of the 1980thBetween 1980 and 1990 the "HIV-hunter" was the most quoted scientist worldwide. And he is still tireless, he likes his work in his laboratory in Maryland – and he believes, that his dream of a world free of HIV and Aids will become true. "Even if it is more difficult than we expected it to be", Gallo says. "I think we will have a vaccination in ten or 15 years. That will not only be a breakthrough in the fight against Aids, but in biology in general. If we know, how to stop HIV , we will be able to stop other Retroviruses as well." Though best known for his co-discovery of HIV, Gallo and his team also pioneered the development of the HIV blood test, which enabled health care workers for the first time to screen for the AIDS virus - leading to a more rapid diagnosis while simultaneously protecting patients receiving blood transfusions. His research also helped physicians develop HIV therapies to prolong the lives of those infected with the virus. Gallo is the author of more than 1 100scientific publications and the book "Virus Hunting - AIDS, Cancer and the Human Retrovirus: A Story of Scientific Discovery" . Personal questions he answers much more guarded. The happiest moments so far? "This is an extremely personal question and one for which it is very difficult for me to formulate a concise response. Happiness is a word that I have yet to hear well defined. I wonder even how to answer the question. If translated to mean a sense of pride, wonder and painlessness, then I would say that the happiest moments of my life are my wedding day and the birth of my children." Robert Gallo has two sons. He and Mary Jane Hayes married after his second year of medical school. "If translated to mean a spirit of exhilaration, it would surely be those times I've spent seeing the wonders of the Earth, like the Amalfi Coast of Italy and the great cathedrals of Europe. 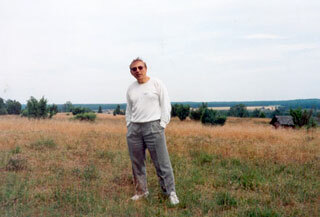 If happiness means a feeling of being totally free-spirited and a feeling of being related to and accepted into a group, then I would think of the wonderful June days I spent in the Wilsede forest in the 1970s. If happiness is defined as being at peace with nature, then my happiest moments would be those I have spent bicycling along the Danube River in the Wachau Valley and bicycling in the Lüneburger Heide." And what makes you sad? "I think of the death of my sister as a child. Then there are the personal attacks that were waged against me during a period of five or six years. These attacks were particularly devastating and were a huge distraction at a time in my life that I could have otherwise been at my most productive", answers Gallo and adds: "I would really prefer not to speak about the painful parts of my life." The disputed question, whether Robert Gallo or the French Scientist Luc Montagnier had discovered the HI-Virus, belongs to those parts of his life.
" I had been influenced by experiences, including meetings with pathologists, that were related to my sister's death from leukaemia when I was 13 years old. One pathologist, Dr. Marcus Cox, allowed me to accompany him in the lab and I even assisted him with some examinations when I was 18 years old. I of course was also familiar with the Dana-Farber Centre Institute in Boston as a function of my sister's illness and I had spent time with an uncle, who was a zoologist. Further still, my father, who was a metallurgist, was always reading scientific journals. All in all, though, there was no specific point in time when I decided that I wanted to study medicine. I just seemed to know it and, ever since I was 17 or 18 years old, I knew that I wanted to focus my energies on blood cell research." In early years Gallo started to dream of a life, which would allow him to do research in life science. 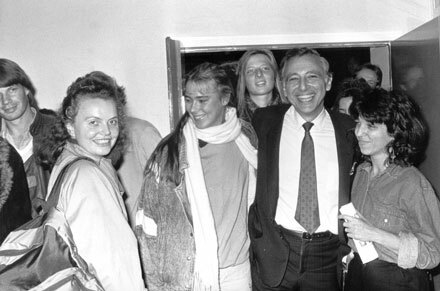 Nonetheless Robert Gallo was a fairly normal kid. He wasn't a very good pupil, his favourite subjects were chemistry and history – but he really didn't like going to school that much. "There were even times when I didn't like it at all, such as when my teachers were being tough with me, something not at all uncommon in my earlier years in school. Like most kids, I did not like to go to school when the weather was nice", Gallo tells. But he was decent in elementary school, mediocre in the first two years of high school and much better in the final two years of high school. He was good in college and excelled in medical school. He worked a lot at that time. "In medical school when I was studying anatomy, it was agonizing because I never knew whether I had yet learned enough", Gallo remembers. "I didn't necessarily know even how to define "enough" in those years." But all the time he knew, what he wanted to achieve: He wanted to eliminate cancer, the illness that had brought the early death to his sister and a deep sadness to his family. And he had idols. Marcus Cox was one of those persons, who influenced him a lot, but he wasn't the only one. "As a boy it was the great American baseball player Joe DiMaggio, who was an Italian-American, like me." Nowadays Gallo doesn't play baseball, but he swims and – even his knees hurt – he plays tennis from time to time. If Robert Gallo wants to relax, he prefers watching sports, especially baseball and American football. Well, Marcus Cox influences him obviously till now. As Gallo got older, he focused on people with whom he wanted to work with. In the medical school he admired Dr. Franklin Epstein, a kidney and metabolic disease expert at Yale University. 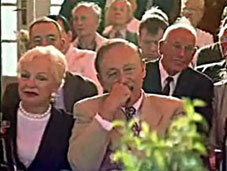 "And then there was Dr. Allan J Erslev who I particularly idolized. He was from Denmark and had come to Philadelphia via Harvard. It was with him that I published my first papers (ERYTHROPOIETIC RESPONSE IN CHRONIC PULMONARY DISEASE) and did my first research, some of which took place during the summer academic break. Erslev taught me much. I also read more than once "Microbe Hunters" by Paul de Kruif and the subjects of that book were all heroes to me, especially those from the "romantic" era of microbiology, namely the Germans Paul Ehrlich and Robert Koch", he adds. He lived und lives such an interesting and exciting life, that it is hard to image, that he would have lived at total different life. "I could imagine it, but that would be to imagine me not being me and that is difficult. Could I have been happy doing something else? Perhaps I could've been happy doing things related to archaeology, though at times it must get boring. Perhaps I could have also been happy studying the history of different peoples", he supposes. But he didn't and he has quite clear aims, he still wants to reach. "I would most like to get rid of HIV forever. I need to stay healthy and live a long life to be able to do that. Getting rid of HIV would allow me to do something else I would like to do, namely returning to cancer research." That's what he started his scientific life with. At the Cancer Institute of the National Institutes of Health ( NIH) Gallo worked for 23 years, he was head of the laboratory of Research of Tumor cells. Since 1996 Gallo leads the institute of human virology at the University of Maryland in Baltimore. Since that time he and his team search for substances against Aids. As mentioned he will present vaccination in 15 years. If Gallo would reach this aim, that would make him proud, and bring him probably the desired Nobel Prize. 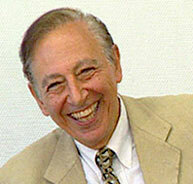 But there are several other things, Robert Gallo is already happy about. "Professionally I am proud of several things, including being able to see so many of my former young associates do so well once on their own. I'm also proud of having been the most-cited scientist in the world during the 1980th. Lastly and certainly not least, I am proud that the fruits of the research carried out by my colleagues and me have become clinically applicable. In other words, research I have done has truly helped people around the world", Gallo says. In Cooperation with other "HIV-hunters" Gallo is travelling around the world – and quite often he comes to Germany. 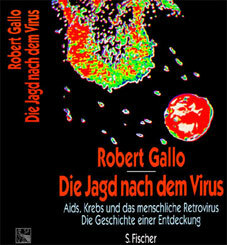 The research on HIV and Aids at the University of Hamburg was deeply inspired by Gallo. Without him the Wilsede Meetings would not have been as inspiring as there were. Gallo believes in the ethical responsibility of every scientist – besides all big business, which can be done in Life Science. "Scientists must have a social conscience and must take into consideration ethical and moral considerations. A scientist cannot and should not be free to do anything he/she wants. From time to time, though, and increasingly so in recent years, I have spoken out, both individually and as part of a larger group, on policy issues related to HIV/AIDS." Well meeting Gallo is always something exiting. Respected Senator Dräger, respected Dean Prof. Stahl, dear Prof. Gallo, ladies and gentlemen, if we look back on the career of a successful scientist we do it with the wisdom of hindsight. Such a career appears straightforward and even appears to follow a logical development. Of course this is not clear for the one who is in the middle of this process and has to struggle to get success and recognition. Prof. Gallo’s career is a good example for this. It has taken long for him to find his ultimate success and recognition and one of the most remarkable features of his career is his perseverance in reaching the ultimate aim when nobody was willing to believe that there are retroviruses in man. The theme of his career was already set so early: the basic biology of human blood cells and there normal and abnormal behaviour. His first papers were published on the biology of haematopoietic cells and then on the biology of leukaemia cells (Nature 1968, 218:465). In these early years of tumor virology it had been found that retroviruses are the cause of leukaemia in a number of animal species, in birds the avian leukosis and leukaemia viruses, also in cats, cattle, mice, rats, even in primates. In 1970 Howard Temin discovered the reverse transcriptase that made it possible to specifically search for retroviruses. Many groups including Prof. Gallo’s started to search for retroviruses in man but this turned out to be very frustrating efforts. All other groups gave up but Gallo’s group still continued, virtually alone. I remember from my time as a young postdoc in virology how discredited the idea of human retroviruses was. In parallel his group worked on growth requirements for bone marrow stem cells and leukaemia cells. They found that a major colony-stimulating factor GM-CSF was produced by T cells (J Natl Cancer Inst 1974, 53:1583). Using similar techniques they made the groundbreaking discovery of T cell growth factor, today interleukin-2 (Science 1976, 193:1007). Although initially the scientific community did not really understand its importance, IL-2 has become an invaluable research tool in immunology and has also been used in therapy. It is something every student has to know and it may be reason for pride that IL-2 is now so common knowledge that in no textbook its discoverer is cited. This ability to grow T cell in culture now allowed in 1980 the isolation of a human retrovirus, human T-lymphotropic virus (HTLV-1) from leukaemia cells (PNAS 1980,;77:7415). In a series of papers Gallo could show that HTLV-1 is the cause of an adult T cell leukaemia that is endemic in Japan and the West Indies. Two years later they discovered a second retrovirus HTLV-2. It was now proven that there were retroviruses in man. Since such retroviruses in animals cause also profound immunodeficiency Gallo and colleagues suggested that similarly a human retrovirus might be involved in the pathogenesis of the novel disease AIDS. This T cell culture system for the isolation and propagation of human retroviruses then 1983 used to discover HIV independently by Gallo’s laboratory and the group from Pasteur. After this highlight additional breakthroughs followed. The isolation of a new human Herpesvirus, HHV-6, the cause of Roseola infantum, major studies on the pathogenesis of HIV-infection and the molecular biology of HIV, on Kaposi-sarcoma and then on new strategies for therapy and prevention. In recent years chemokines were discovered by his group as suppressive factors for HIV, and innovative steps in development of a vaccine against HIV, all this published in the highest ranking journals. This morning at 11 h Medline showed 855 publications of Prof. Gallo, it might be more meanwhile. 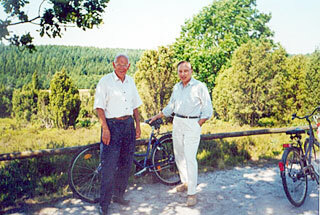 Prof. Gallo is one of the most renown scientists of the world, he was No. 1 on world list as most referenced scientist between 1980 and 1990 and is still in the top group. The number of honours and awards he has received is impressing, there are 15 honorary doctorates, many honorary memberships in scientific societies and he is a recipient of many very prestigious awards. As the Dean has indicated. although his scientific merit would be enough reason, there are several reasons why just the Hamburg School of Medicine has decided to offer him an honorary doctorate. 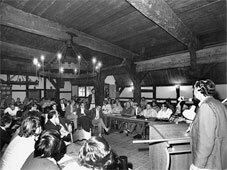 First there is a longstanding cooperation in the organization of the Meeting “Modern Trends in Human Leukemia” that takes place since 1973 in Wilsede. 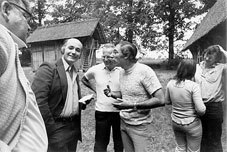 Robert Gallo has in fact been one of the initiators of this meeting in 1972 together with Rolf Neth and has since been a true friend of this meeting and a frequent guest speaker. Although this meeting has a very high scientific standard (otherwise it would not attract the best scientists) it has an educational aim and invites young scientists (or those which hope to become a scientist) to live and discuss with the celebrities. I myself have been there in 1978 with a Wilsede fellowship and have enjoyed its very special informal atmosphere that you can imagine here on this picture. Here you see our laureate in the early seventies, apparently very much involved in the discussion. Moreover, Prof. Gallo has also been a frequent guest speaker at the University of Hamburg and several members of our Fachbereich have during the years had benefit from cooperations and visits in his institute. On the web-site of his institute Hamburg is explicitly listed (http://www.ihv.org/collaboration_map/index.html). Very noteworthy is the cooperation on the field of AIDS research and diagnostics. Prof. Gallo has very shortly after the discovery of HIV given his HIV-infected cell lines to the Institute of Medical Microbiology to use without any restrictions. This has enabled the Institute to perform already in early 1985 when commercial tests were not available to perform screening of blood donors. In fact several HIV-infected donors could be identified and excluded and this has certainly saved several lives. And also I am proud that there are longstanding scientific cooperations with the Bernhard Nocht Institute - already since 1985 the pathologists Klara and Paul Racz cooperate on the persistence of HIV in lymph nodes. 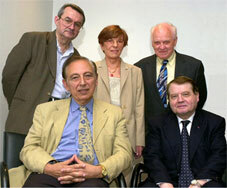 Here you see Dr. Gallo and his longstanding coworker Michael Popovic with Klara and Paul Racz and Luc Montagnier on the occasion of the German AIDS Congress in 2003 in Hamburg. Finally I want to tell you that Prof. Gallo is not only a unique scientist but also a fabulous writer. He has written a book about the long way to the discovery of the retroviruses. This book is a fascinating mixture of a scientific thriller, an autobiography and a textbook of virology. So everyone who is interested in more details can find them in this book, but I warn you: it is very difficult to stop reading.